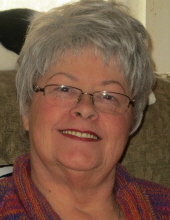 LODI-Judith J Wopat, age 74, of Lodi, passed away on Friday, February 8, 2019 at Agrace HospiceCare. She was born on March 2, 1944, in Chicago, IL, the daughter of Gene and Lorraine (Hoffman) White. Judy married John Wopat on Nov 10, 1984. She was a founding member of New Life Christian Church where she was a strong woman of Christian faith. Judith enjoyed cooking, shopping, doing needlework; spending time with family. In addition to her husband, John, she is survived by her son, Gig Chingo; daughter, Joelle (David) Adinarayan; grandchildren, Cassidy and Breezy Adinarayan; great-grandchild, Deliliah Munger; sister, JoAnn Butkas; and brother, James White. Funeral Services will be held at NEW LIFE CHRISTIAN CHURCH, 310 Millston Ave., Lodi, at 2:00 pm on Sunday February 17, 2019, with Pastors Mitch Falk and Lois Falk presiding. Burial will be held at Mt. Pleasant Cemetery. Visitation will be at the church from 12:00 pm until the time of the service on Sunday, February 17, 2019. Come as you are. Online condolences may be made at www.gundersonfh.com. "Email Address" would like to share the life celebration of Judith J. Wopat. Click on the "link" to go to share a favorite memory or leave a condolence message for the family.